Hai to all how to generate a report for the desktop application using xojo with MySQL database with open source tool or any plugins. Please help me to fix this. · Aldrin M likes this. I don’t understand why people hate Xojo Report. I agree it’s not the top, but I find it good enough and quite powerful. 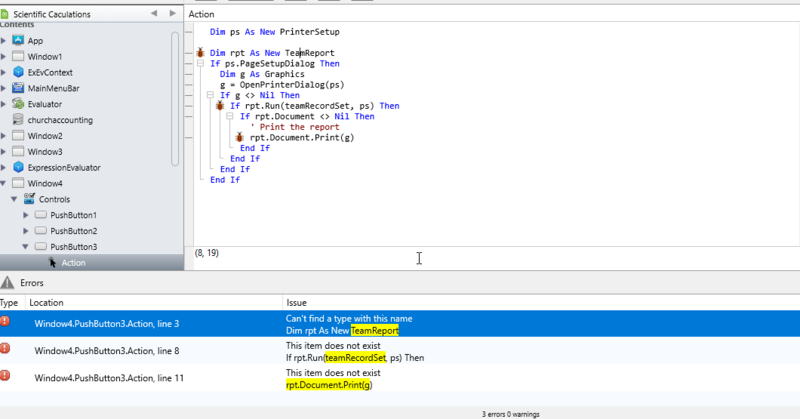 mainly because it's limited and buggy, and you cannot expand what you need to print precisely. and xojo does'nt seems to make any update for some time. it's like the database editing system inside the IDE, exists but not usable daily. · Sascha S and Tim P like this. @Nedi F I don’t understand why people hate Xojo Report. I agree it’s not the top, but I find it good enough and quite powerful. If good enough works for you then use it. It wasn't for us and so we created BKS Shorts. End users can't edit the report, or search the result. You can't get any events out of the report. You can't export it to anything else. The list goes on and on but you won't find those limitations until you need them. Sort of like Introspection and Delegates where you don't know you need them until you do. Shorts is used by a fair number of developers and we use it in a lot of consulting projects and keep adding to it. It's also a 2018 Xojo Design Awards winner. After using xojo reports, I am facing some issue Please help anyone basically I am a beginner in xojo, Any Plugin to install to fix this error. Where do TeamReport comes from ? Same questions for the two other errors. @Emile S I have copied the code from this Url.